DU Battery Saver ~ Best battery saver app for Android! →DU Battery Saver ~ Best battery saver app for Android! Android users looking for best battery saver app for Android devices – try out DU Battery Saver, an excellent Android battery saver. Android is a popular mobile phone Operating System and one of the main problems faced by Android users is related to battery life. Constantly running apps, games, connecting to the net and making calls keep your android phone very active and this hugely pulls down your battery. Sometimes you may ask why your phone’s battery keeps running down during moments you are not actively using it. The simple reason is that there are always background applications that constantly run and some of these applications may not be required. Most of us have to move around with our phone chargers because once charged to its full capacity, it won’t take long for it to run down. Keeping your device connected to the charger all the time can damage your battery or reduce its life. I know you are searching for the best battery saver app for Android so let’s look at something that’s proven to be the choice of over 100,000,000 Android users. 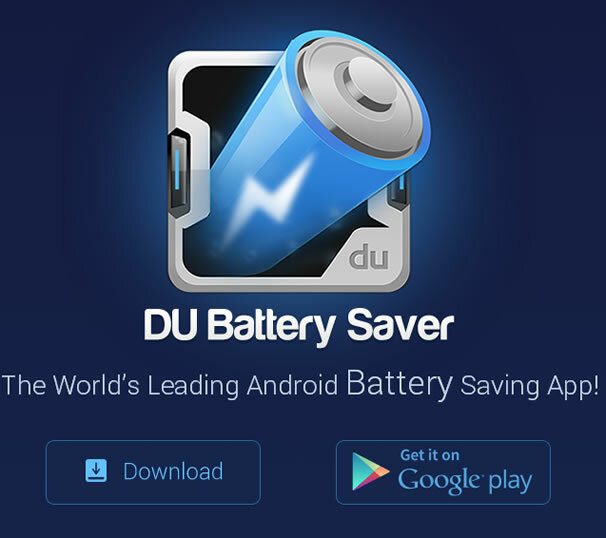 DU Battery saver is a free Android battery saver that can get up to 50% more battery life for your Android phone. It’s the world’s leading battery saver & power manager with over 100m downloads. Many of these users have described it as the best Android battery saver. This app is simple and goes straight to solve the problem it’s meant to. It’s easy and user-friendly. It does not require any complex procedures to operate. First, we have the “Optimize” button with an advanced technology to instantly find and solve battery problems. This allows you to stop power-consumptive background apps with one tap to boost your battery life. For the most part, some of these background apps and hardware are not required to constantly turn on. I used to have my bluetooth component constantly running even when I don’t need. The other day, one of my colleagues had her Wi-Fi turned on in the office while she actually was working on her desktop PC with absolutely no need to connect to the local network with her mobile. There are many of such apps and hardware that run without your knowledge and this contributes highly to discharging your battery so you actually need an intelligent battery saver to locate this apps and turn them off. Multiple Android battery saver modes! DU Battery Saver functions in different saver modes so you can effective manage and prolong your battery’s life. Apart from these 3 Pre-set Modes, you are able to create a custom mode (with the “Add a mode” option) to get exactly the battery savings you need. Management and turning off some background apps is an efficient way to safe battery. Some of these apps are constantly running even when you don’t need them. The main issue has been how to identify and stop some of these background activities. DU Battery Saver is an excellent android battery saver with an intuitive interface that shows all active background applications with an easy button to switch them off. Your Smartphone Battery (Lithium-Ion battery) needs to be discharged to below 20% of capacity, then charged fully often. This is recommended once a month. The Healthy Charging Manager in DU Battery Saver tracks and implements healthy charging practices in different stages to keep your battery working its best. Are you an Android device user? What in your opinion is the best battery saver app for android. Let me here your thoughts in the comment box! i am using it for long, but at the end of the day, my Smartphone is back to 10% Battery Power. Perhaps the things you mentioned can help me get most benefits of DU Saver. Nicely Explained, As Always !! I was searching for battery saver app for my Android phone. Maybe the things you said can help me get most profits of DU Saver. Hi Enstine, I really love dubattery saver and have been using it for a long period of time on my android device. I can say it’s excellent with the PRO version a using. Buh i can see you don’t talk about the smart saver section which haves the features I love most using the app. Mobile data control, switching mode and others. Wow – that looks great 🙂 My Android phone is always running out, even though I don’t feel I use it a lot. I’m going to download that App – err, as soon as I’ve finished recharging my low battery! You never cease to amaze me with the variety of topics and information you come up with. I’m sure there are some background apps that run down your battery. This is a wonderful app to try out. I personally have it on my phone and it’s needless to say I charge it less often than before. I just HAD to come back and share my experience of installing this app, even without getting “clever”…. Before I installed it I was having to recharge the phone every day. I installed it and did the basics and recharged when I read your post. The charge lasted THREE days! Finally, I got the answer why my android phone always down. Honestly, I wonder why the battery is working under my expectation. I just bought my android on January but it seems unsatisfied with that because of the battrey problem. Thank you for sharing this great post. I am already using DU Battery Saver app on my android app. And it’s really very helpful to save battery life and monitor its usage by other app or program. Thanks for sharing useful app to the community. I think the best brand of Batteries are Uniross and they have some great Battery chargers and nice prices I shop with them all the time and have done for years! I have been using DU battery saver in my mobile and its the best battery saver app i have used. Very efficient in saving battery and acquires very low space. Thumbs up for the great app! Battery is seriously a major concern for all the smartphone users as at the end of the day, battery falls down to less than 5% and can’t be used it for anymore. Thanks bro for introducing us to such an helpful and amazing app. Hope to increase the battery life to few more hours. DU Speed meter is top free apps on google Play Store. It is so helpful for 1GB RAM phone user. But who have less than 1GB RAM is laggy and eat RAM. But over all this app for Android is awesome. Yes, DU speed meter is the best apps present on app store. Previously I was no using it but now when I have started using it I find it very helpful. I heard about this apps but never tried it but I think now I will have to try it becoz my friend “Enstine Muki” have written about it. After observe this post I must try to download this app for my phone .All time my phone battery is gone so fast .I think it will solve my problem easily .Thank you for sharing this post about DU Battery Saver. Yeah its a great app to save your battery life, I also tried battery doctor app to save battery life, to be honest both apps works really great. It really very hard to compare and find out an answer, both apps do the same job and almost in the same way. I also installed this app in my Android phone Huawei honor 3c. Its true that it really saves the battery and it also raised my talking time. But according to my view the working of this app is that it reduces the display light timing to lower and it automatically raises the battery timing. So this technique may also be worked without installing the app. Easily the best battery saver app out there! I usually end my days with just 5 to 10% juice left. This app has surely improved my position. Now I get around 20% charge left at the end of the day. This apps so nice and it used very easily or there is no lack of that apps to used . Du is nice apps but the fact is it full of junk ads and and heavy. Lastly, I got the solution why my personal android telephone always lower. Honestly, We wonder the reason why the electric battery is operating under my personal expectation. I simply bought my personal android upon January however it seems unsatisfied with this due to the battery issue. Thank a person for discussing this excellent post. It seems DU battery saver drains my battery more than it saves ? …..It kind of consumes my RAM as it runs in the background…Anyways,thanks for sharing sir…..i will give it a try ones more. Actually this is so far the best battery saver app I have ever used. Yes it runs in background and consume RAM but if you know to use it properly then it’s very usefull for you. Nice Post. Really a great app you mention for the battery saver for Android Phone. Thanks for this informative article. This is very useful article for android users or smartphones users, and battery saver plays important role into Android phones. Really a great apps for smartphones to saving the battery. Thanks for sharing these helpful information. Will this app save my battery up to 25%, As my battery do not lat to the end of a day? Nice app! I love using smartphones but their batteries drain too fast. I definitely download and try it now. Thanks for the share. Yeah i have used this app on my smartphone and it really does the magic on smartphone, It is really a Great post i really liked and i have blog about apps also and i am sharing some apps that can help you how to make money through these power full apps. Nice post. The main problem faced by Android users is related to battery life, and you provide the best solution for this problem. This is an eye opening article for android users, and battery saver is very important in Android phones. It is also a great apps for smartphones in saving the battery. This is a very nice article and i really appreciate you for sharing this. I think this app is useful for saving power to our device. Android phone is very useful and popular device in the world. So in this field I think this app is very useful. I know this post is about an app that could save you some extra battery life but have you heard of external batteries or power banks? They’re quite handy and easy to carry around. Of course it doesn’t beat having an app that you don’t physically have to carry but still gives you an extra few hours of battery! it really saves powr…i am using it man.. Yes, this app make your battery life better. Besides this application is very useful and popular for android phone device in the world. I love the DU Battery Saver App. It does good job. It keep my phone smoothly and I don’t need to download any cleaner app. Currently i am using battery doctor working very good for me.Here i found some cool features which battery doctor don’t have will try Du battery saver thanks for sharing information . Thanks. and keep share the new things.. Awesome review of DU battery saver and I am gonna install this app ibn my phne for sure. Thanks for sharing. I do have a question here, does it run in the background? if yes then dun you think it will eat a lot of battery? I have a smartphone of Xolo cube 5.0 but its battery power is too low.I hope this application will increase the Performance of Power of my cell phone. Thanks for Posting such a valuable application. The best and the easiest app to save battery is Long Battery Life. It does it work very effective + shows battery indicator with % on status bar. What do you think about it?